Large sized nonoptimized images will negatively affect the speed of your website. An image should be properly compressed in lossless quality before uploading to the posts. If not, they will occupy a huge space in the server that results in diminishing your page speed and search engine rankings. Why are you taking the risk of losing traffic just because of the optimization issue? There are several image optimization plugins available for WordPress users to reduce the size of images which are being uploaded to the internal media library. But most of them limit their free service for up to 500 images per month. It means you have to make payment for crossing the limits and compressing any extra image if you have. Ooopz. It is not possible for the beginners and small-scale websites, as you know. What will they do if their library contains thousands of images like us? This post shows how to optimize all your website images in bulk. Install and activate ‘WP Smush‘ plugin on your website first. It is a free, simple plugin to automatically compress images on upload. Choose your image types and set a maximum size for images on your server. That’s all. Smush will do the rest. The plugin will compress the images as they are being uploaded without losing the quality and thus reduce the burden on your website server. WP Smush uses powerful built-in tools to handle the operation and works in lightning speed. It can process popular image types like JPEG, PNG, GIF and efficiently scales down them to the required size. If you have just installed the plugin, there may be thousands of nonoptimized images in the media library depends on your website size. In such a case, you will need a bulk optimization. Open Smush menu from the left pane of your WordPress dashboard (bottom side). Choose directory Smush. Now it will ask you to select a folder to process. You can either select a certain folder or expand it to view and select the sub-folders. 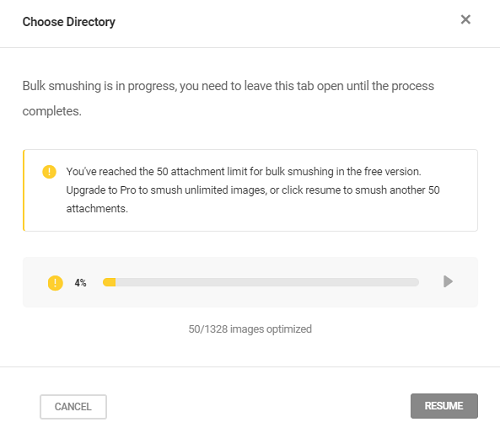 Click the Smush button to begin the bulk optimization. 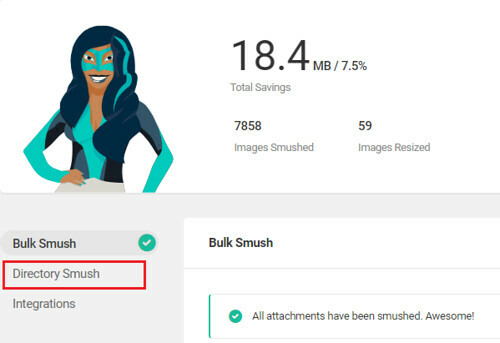 Smush will optimize your images quickly as usual. But it may take some time if you have so many images in the queue. 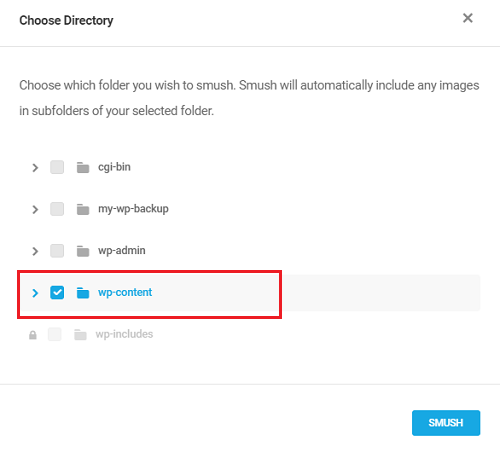 WP Smush Pro which is the premium version of the plugin lets you optimize unlimited images in a single click. But in the free version, you have to resume the operation for every 50 images. When reaching the limit, you will get a message like this. Click the Resume button to smush another 50 images and repeat the step until you optimize all images in the directory. Once it smushed all images, you will be directed to the main screen of the plugin and you will see a confirmation message there on the top.